Most of the quilts I have done on my Quilt Path have been edge to edge. That is really the reason I was looking for a computer system. I did not do pantograph quilting before Quilt Path, so the idea was to give my customers another option. Since I equate traditional panto quilting with watching paint dry, the only viable option for me was a computer system. The custom quilting I have done with Quilt Path was mostly dropping patterns in a way that they did not need to be super accurate. Like putting a name or year in a border that I would then freehand around. This month I decided to do a custom quilt with Quilt Path. And to do that I would need to be able to accurate place the patterns. For today's post I am working in Select and Sew - Patterns. By default, the set pattern screen comes up with Block-Stretch selected. 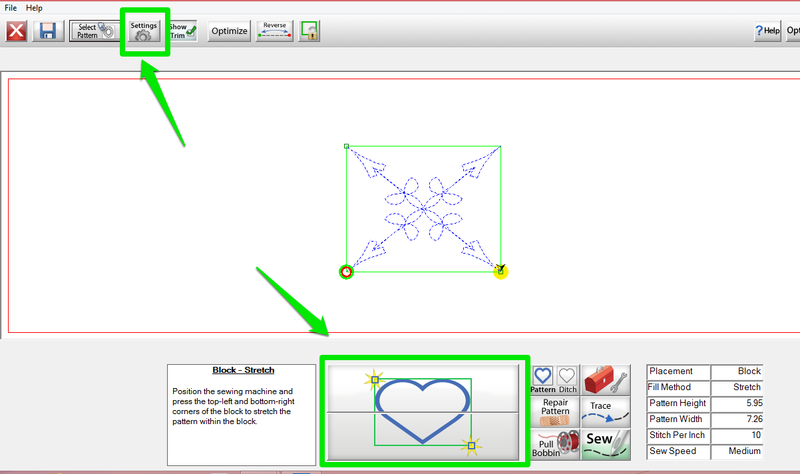 If you look at the bottom of the screen you will see that the heart block buttons only have two places that you will be using to set the pattern. The top left and bottom right of the space. This is what I had used before when I was doing my "close is good, because I will be free-handing around it" method. But when you are using a pattern, like the stock pattern shown on this screenshot, and it is going to fill the block, you are probably going to want those points in the corner to actually end in your corners and possibly come extremely close to touching the motif in the neighboring block. To do that you really need to be able to tell Quilt Path where all four of your corners are located. And you need to understand how to get Quilt Path to manipulate that pattern so that it hits all four corners. Let's tap on the Settings button at the top left of Quilt Path. In future post we will talk about all the things you can do on this screen but for this post we will be talking about the Fill Method options that are inside the area I have highlighted with the green box. You will notice that the Block button is depress and the Stretch button is depressed. Let's talk about those Fill Methods. Stretch means the block is being distorted, if necessary, to fill the space you are designating. So if you are using a design that is a square and want it to fill a rectangle this is the option you would use. 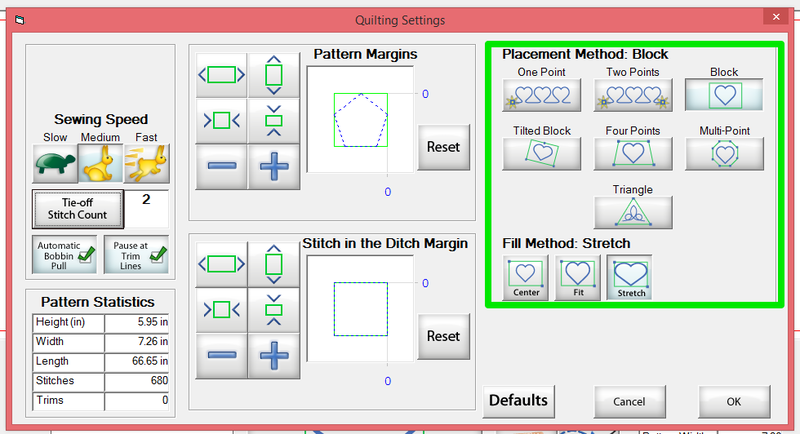 This option also works for those times when the quilt was not perfectly pieced and the blocks are not square, but you want those points to hit the corners. Center means that it will center put the block into the center of the space, but that the block dimensions will not change. This is handy for things like feathered wreaths that you want to float in a blank alternating block and that you want to be identical throughout a quilt. Fit means that it will scale the block to fit into the space that you designated but will not distort the block. So if you have block that is designed to stitch a 6"x6" square and put it in a 8"x10" rectangle it will end up stitching a 8"x8" square center on the 10" side. And for a teaser for next week... notice that there is Four Point Placement Method. I won't be getting my new machine with QP until the 1st of March, so I've been using the Demo version to try and learn. I've also printed everything I could, including your wonderful help on this blog. I just sent a message to Cabin Logic about updating the demo version on line so we can get those new help files. I find the one help file that's included with the .03 version very helpful, so I hope we can all get the new help files once they update the demo version. I'd really like to have them soonest to study from. Thanks for what you are doing to help us learn. Glad I can help. As you are learning the system if you find something you would like to have covered, please ask.